When the Kinect SDK first launched, researchers began looking into ways to make the technology more accurate, allowing it to do much more than tracking bodily movements. 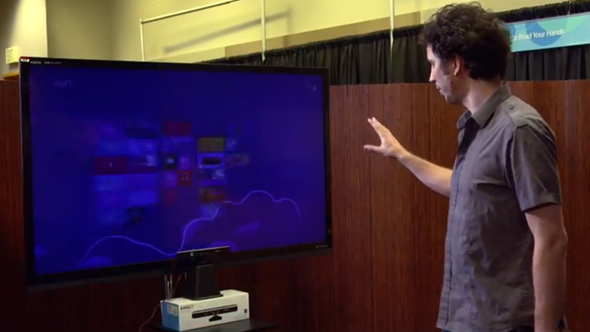 Although such advancements have yet to manifest in the popular peripheral, Microsoft has today showcased a feature allowing for the fine-tuning of gesture control, allowing the Redmond company’s Research team to simulate multitouch gestures on a PC, but over the air. The hardware used in the research does not doesn’t appear to be stock, so it is very hard to tell whether this is just vague experimentation or part of a wider effort towards improving Kinect, but either way, it’s promising. Since release, the Kinect has been an undoubted success, but with the next-gen Xbox now on the horizon, it’s only natural Microsoft would want to research ways of bumping the Kinect in a similar fashion. The past couple of months has spawned quite a few new entries in the world of highly accurate gesture control, and it really seems as though we’re moving above and beyond the current limitations of commercial offerings from the Wii and Xbox Kinect. Leap Motion’s superb hardware offering 3D gestures to PC and Mac users is set for release later this year at the agreeable price of $80, and with some 12,000 developers having been working to ensure a handsome ensemble of compatible apps from Corel to Cut The Rope, it will be intriguing to see whether the world is ready for this kind of technology on a broader scale. As well as Leap Motion’s effort, another company by the name of Thalmic Labs offers a slightly different, but equally exciting product in the form of MYO. The wearable device is strapped to the arm, and uses a bunch of sensors to determine exactly what gestures your arm or hand is making. The market is becoming ever more crowded, and although the Kinect remains the most popular gesture-based peripheral by quite some distance, one suspects it will need to continue improving if it is to retain that kind of dominance. Microsoft Research may be finally delivering the more substantial Kinect technology implied with those initial efforts, and we’ll excitedly keep tabs on proceedings in the hope we’ll see some new Kinect capabilities with the next-gen Xbox.